Summary: Carlos Portillo has always led a privileged and sheltered life. A dual citizen of Mexico and the United States, he lives in Mexico City with his wealthy family, where he attends an elite international school. Always a rule follower and a parent pleaser, Carlos is more than happy to tread the well-worn path in front of him. He has always loved food and cooking, but his parents see it as just a hobby. Review: Adi Alsaid excels at building a world. Whether Carlos is exploring his new home with Emma or at a party or in the kitchen at Provecho, it is easy to imagine the world he moves through. The kitchen itself is a highlight, filled with strong personalities and amazing food descriptions. Starting each chapter with an ingredient list for a recipe (for a dish that usually, if not always, showed up in the chapter) was a fun touch and an easy way to remind the reader just how much food and cooking mean to Carlos. 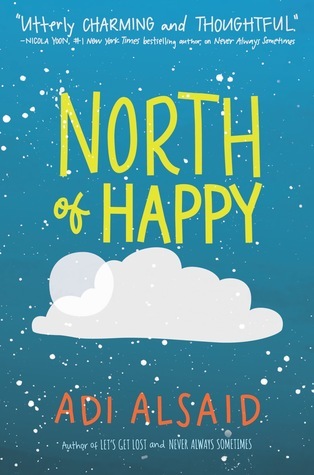 The interactions between Carlos and his hallucinations of Felix were one of the best parts of North of Happy, especially since it gave Carlos the opportunity to question what he actually wanted out of life. Deciding that his father’s plan wasn’t for him was the beginning, but that’s far from deciding on a direction that he actually wanted for his life. The pushes that Felix gave to Carlos were just as important as the times that Carlos pushed back, and it was great to see Carlos deciding for himself what would and wouldn’t make him happy. There were two main weaknesses in my opinion: the lack of screen time for the relationship between Carlos and his father and the underdevelopment of Emma. I never really got enough of a close look at Carlos’s father to be able to fully understand why he was at such odds with both their sons. This undermined the conclusion of his arc for me since it made the ending feel at least partially unearned. Emma’s character was never allowed to flourish for me; or at least, I craved something deeper from the book on her behalf and didn’t feel like I ever quite got it. She swung very close to the Manic Pixie archetype at times and spent many of her interactions with Carlos as his unwitting therapist. That said, there were several excellent scenes between Carlos and Emma that gave Emma depth, and the culmination of her arc was a (mostly) pleasant surprise for me. Finally, I do wish there had been some kind of overt mention of Carlos getting help for his mental health at the end. (If it was there, I missed it.) He was hallucinating his dead brother for months, struggling with depression, etc., and while Carlos does admit to not being entirely okay, it would have been nice to see him working toward getting him the assistance he still needs. Recommendation: Get it soon, especially if you have an interest in the culinary arts. While there are a few missteps in the book, Carlos is an engaging narrator whose story is likely to resonate with a lot of people. If you’re in the mood for a book about grieving and growing up, this will probably hit the spot.